"When I first began my career as a cook in San Francisco, I remember talking with a Chef about an upcoming menu on which he was thinking of using polenta as the side dish. I asked him if he was talking about polanda. He said he'd never heard of polanda. I called my mom and told her we were going to serve something called polenta at the restaurant. I asked her if she had ever heard of it. She laughed and said that they were the same things! She explained that 'pol-an-da' was just our family's mispronunciation of the actual name polenta. I was pretty embarrassed, to say the least!" Melt 1 teaspoon butter and olive oil in a saucepan over medium-low heat. Cook and stir 2/3 of the corn, with a pinch of salt and a pinch of cayenne pepper in the hot butter and oil until the corn is fragrant and golden, about 10 minutes. Add garlic; cook and stir until fragrant, about 30 seconds. Pour 2 cups water into corn mixture; bring to a simmer and whisk polenta into mixture. Bring to a simmer again, reduce heat to low, and simmer, stirring occasionally, until mixture is thick and polenta absorbs the water, 20 minutes. Add remaining 1/2 cup water and stir; cook for until water is completely absorbed, about 10 minutes more. 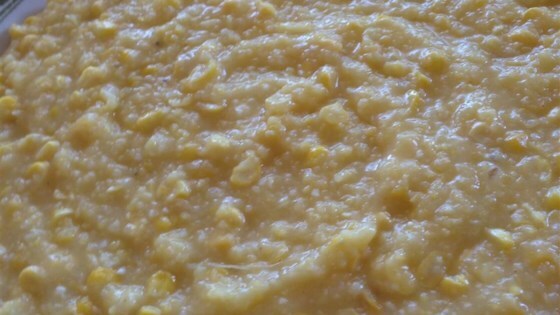 Stir remaining corn and 1 teaspoon butter into polenta mixture. Remove from heat, cover the pot, and let sit for 5 minutes before serving. Made this today to serve with Chef John's Pork ala Latte. Used fresh corn that I had previously frozen. Did not have polenta so used cornmeal added more salt and cayenne.